It’s so easy! Four weeks to Great Skin! Here I am peering into the mirror wondering if my skin is looking it’s best. Am I doing enough? Certainly I look at least ten years younger than my true age. Right? When you work for a skin care company, everyone takes a very long, close look at your skin and you do, too. Constantly! It’s….alarming. Have I been following the directions on my pretty glass bottles, using my products regularly, thus giving all those Active Ingredients that Work™ a chance to create a glowing, better-than-ever complexion! These are the questions I ask myself. And sometimes, I know the answer is NO, I haven’t been exactly sticking to my proper routine. That’s when I turn to my tried-and-true, easy-peasy, I-know-this-will-work routine. Just three simple products will get my lovely visage ready just in time for all those important events that are just four weeks away. To get my countenance looking glowy and wonderful quickly, first, I work on removing the dull old skin on a regular basis (Age-Limit). 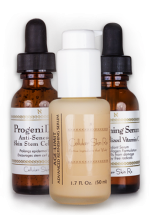 Once that fresh surface is prepared, I stimulate new skin cell production (ProgeniDerm™). To protect those fresh new cells and reduce melanin production – good-bye age spots – I apply a powerful antioxidant (C+ Firming is my favorite). I know that regular use of these three products plus DAILY SUNSCREEN (absolutely necessary to maintain results, darlings) will yield a gorgeous, glowing, beautifully textured complexion for moi. Voila!This makes me very happy! ***Add our new Full Appeal™ Face Plumping Complex to add volume where you need it. Get your apple cheeks back again!